The requirements for bonding and grounding permanently installed indoor and outdoor swimming pools are provided in Article 680 “Swimming Pools, Fountains and Similar Installations” of the 2005 Edition of the National Electrical Code (NEC®). 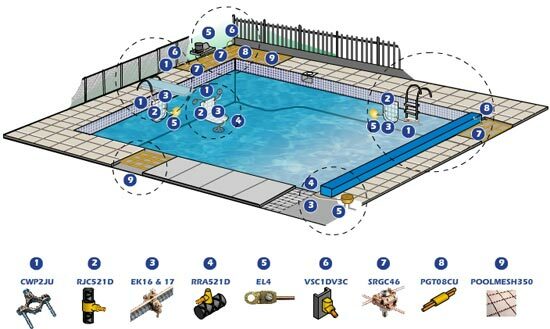 All of the bonded parts in or around swimming pools must be attached to an equipotential bonding grid. This grid must extend 3’ beyond the inside surface of the pool under concrete, stone or other paved walking surfaces. ERICO® offers ERITECH® brand of Prefabricated Mesh as a convenient, efficient and economical solution for equipotential bonding grids. This prefabricated mesh is constructed with #8 AWG solid copper conductor with 12” x 12” spacing. It is available in 3’ x 100’ rolls, as well as in other convenient sizes. ERICO also manufacturers ERITECH brand of ground clamps for use in bonding the mesh to other cable conductors and rebar. You can trust ERICO to offer a wide variety of items to bond per the NEC requirements. Please note that pools made of non-conductive materials (fiberglass composite, vinyl lined polymer or other non-conductive materials) do not require an equipotential grid that covers the full contour of the bottom and sides of the pool. However, an equipotential grid is still required around the perimeter of the pool extending 3’ beyond the sides of the pool. ERITECH brand of Prefabricated Mesh helps ensure all of the bonded parts in or around the swimming pool are attached to an equipotential bonding grid. For an interactive Flash demo of Prefabricated Mesh products, click anywhere on the image below.